Here is another favorite mexican dish of mine. tostadas are good as little appetizers for a party or as a meal, which is what I did in this case. 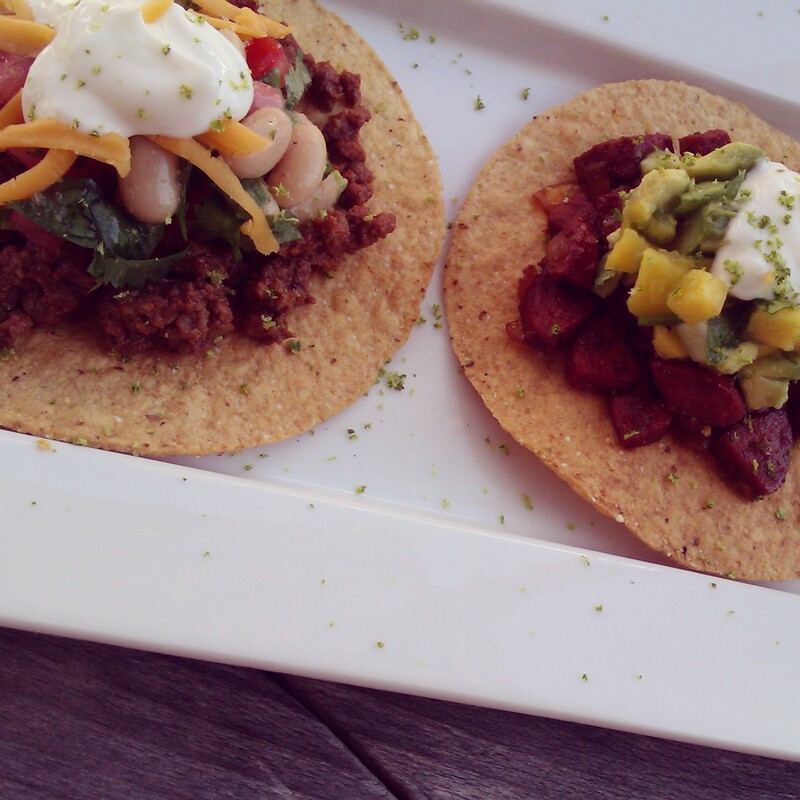 tostadas are pretty much flat hard tacos, which you can get at the supermarket. IF you can’t find the flat tostadas already made, then buy tortillas and place them on a skillet until nice and crispy. You can even have a tostadas buffet, with different toppings. Here I made a ground beef (which you can use vegan ground meat) and chorizo. I made 2 toppings; one with White beans, tomato, and cilantro the other was avocados, mangos, hearts of palm and cilantro. These toppings are fresh and great for summer. Enjoy! In a skillet on medium to high heat add olive oil and onions. Cook onions until translucent. Then add ground meat cooking half way through and add seasonings, garlic and lime zest . Cook for about 8 minutes until meat looks nice and golden. Add tomato paste; stir in until tomato pasted has melted. Add a 1/4 cup of water and Lime juice stir and cook for an additional 3 to 4 minutes. Place into dish and cover. In this case I used the same skillet I used for the ground meat. On medium to high heat add olive oil and onions cook until translucent. Add Chopped Chorizo and cook until it has a nice golden crispy color. add garlic stir and add chipotle sauce stir. Then add half of the white wine stir. Add jalapeno next stir. Last add the rest of wine stir and let cook for an additional 3 minutes. Place in dish and cover. In a medium bowl add all chopped up ingredients and season with salt and pepper. Add juice and toss together. In a medium bowl add all the ingredients and toss together.